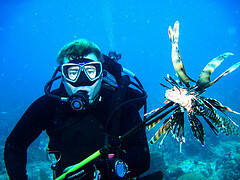 The Skipper Blog: Obsessed with lionfish? Yes! Skip November 15, 2012 Blogs, Conservation, RECENT, Spot, The Skipper No Comments on The Skipper Blog: Obsessed with lionfish? Yes! While you may grumble at my obsession with LIONFISH; all you have to do is visit a reef near you. Lionfish are everywhere and destroy habitat, like a reef, inside of a year. They eat it to death. The spear fishermen you might not have liked is now your best friend if you are a sport fisherman. Venomous Fish A Threat To Florida Waters. Lionfish Hunters Wanted. Alan Pierce of The Florida Wildlife Commission’s Division of Marine Fisheries Management says Florida waters are in danger of becoming infiltrated with the non-native Lionfish, a venomous fish with dangerous spines, and wants to get rid of them. Native to the Indian Ocean and South Pacific, these beautiful yet venomous creatures are spreading through Florida waters like a bad cold, says Alan Pierce of the FWC. Within their native range, lionfish fit nicely into the natural food web and their populations remain in check. But not in Florida. Florida’s native predatory fish are simply not ordering the new and bizarre-looking menu item, leaving little to control the lionfish population. Initial sightings of lionfish in Florida waters began in the mid-1980s. The rarity of sightings initially made it difficult for biologists to assess the significance of the problem. 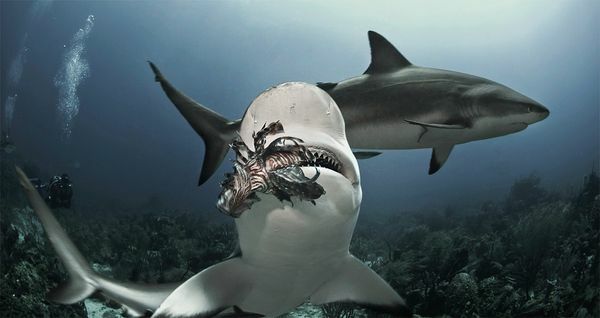 The species spread slowly, but methodically, infiltrating the Caribbean and waters off the Atlantic Coast and Bermuda. By the 2000s, the story became much clearer, as many countries within the invaded range witnessed dramatic lionfish population increases and were forced to initiate control programs. All hope that Florida might somehow be spared was eliminated during the past few years as Florida waters witnessed a population explosion along the southeast coast, including the Florida Keys. Today, we are seeing them in places we’ve never seen them before, including the northern areas of the Gulf of Mexico, as their numbers are increasing rapidly. Maybe this is an answer if we could keep the idiot Mark the Shark Charter boats off the water. This guy Mark kills every shark he catches, then throws them away. Mark operates out of Miami and Ft Lauderdale, Florida. Marine ecologists are concerned that lionfish will significantly alter the population dynamics of the native marine species, resulting in damage to Florida’s reef systems. Lionfish could also negatively affect recreational and commercial fisheries through direct competition for food and habitat. Anything that hurts fishing and diving will also hurt hotels, restaurants, retail stores and the entire economy of the state. The FWC recently eliminated the requirement to have a recreational fishing license for lionfish control when using certain types of spears and dip nets. The change, which is in effect through August 2013, also eliminated the default recreational bag limit. With these changes, which are designed to encourage lionfish-control efforts, the only thing that limits your lionfish hunting is your ability to shoot and the size of your cooler. The FWC notes that lionfish have spines that are venomous and can cause painful wounds if you are not careful when handling the fish. Funding for the Lionfish Program provided by The Elizabeth Ordway Dunn Foundation and NOAA National Marine Sanctuary Program. Generous logistical support has also been provided by Bruce Purdy, Stuart Cove’s Dive Bahamas, and David and Trish Ferguson and volunteers.